In my never ending hunt for Texas jazz records, this one by Fred Gardner’s Texas University Troubadours is a necessity. Unfortunately, the only copy I was able to get my hands on is in rather rough condition. I think it’s still enjoyable, but it’s no prizewinner by any stretch of the imagination. Years ago, an English magazine misidentified the cornet on these records as that of the legendary Bix Beiderbecke, in what they credited as a band organized by British saxophonist Freddy Gardner, who was alleged to have been vacationing in Texas at the time. In actuality, the cornet player on this and the other record from this session was Tom Howell, and the leader was an entirely different Fred Gardner. Cornetist Thomas Alva Howell, Jr., born in 1906, and his brother Lee learned to play by ear, and attended the University of Texas together beginning in 1921, where they played in the Howell Brothers Moonshiner Orchestra. They later joined Steve Gardner’s Hokum Kings, which recorded in 1930 under the direction of saxophonist Fred Gardner in San Antonio for Okeh Records. Howell and his brother also played in Sunny Clapp’s Band o’ Sunshine and can be heard playing on two of their San Antonio recorded sides from 1929, as well as singing on one of their Victor records. Okeh 41440 was recorded on June 9, 1930 in San Antonio, Texas. Judging by the personnel, the band was something of a family affair, and features leader Fred Gardner on clarinet and tenor sax, Tom Howell on cornet, Lee Howell on trombone, Steve Gardner on clarinet, Chester Seekatz on clarinet and alto sax, Tommy Howell on piano, Bill Lewis on banjo and guitar, John Gardner on tuba, and Jay “Bird” Thomas on drums and vocals. Gardner’s Troubadours play W.C. Handy’s classic song “Loveless Love” (a re-working of the traditional “Careless Love”) slow and with a steady beat, and it doesn’t disappoint, serving as an outstanding example of Texas-area territory jazz, with a fine vocal to top it off. 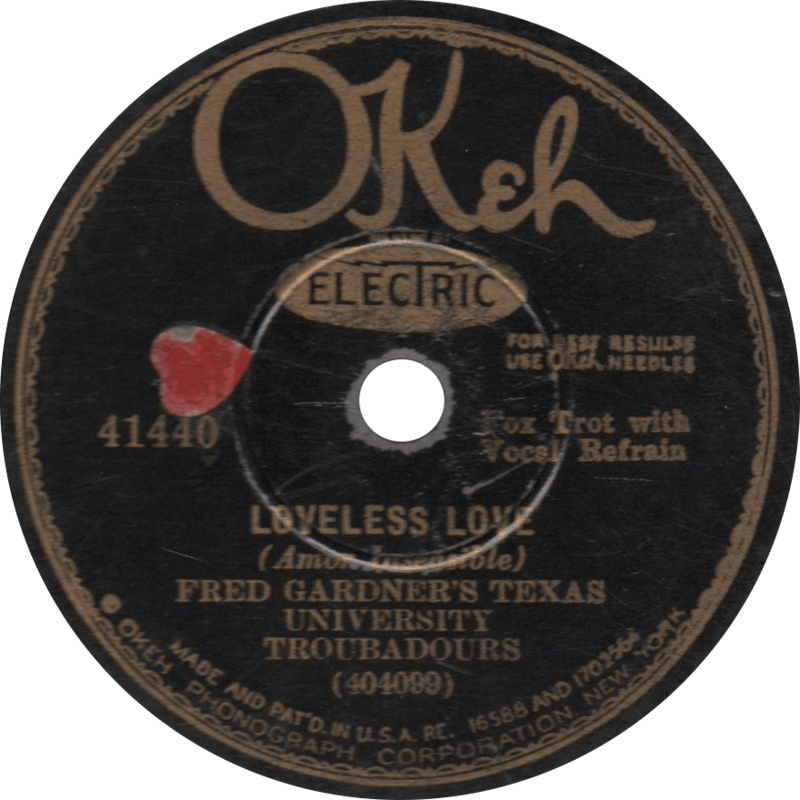 Loveless Love, recorded June 9, 1930 by Fred Gardner’s Texas University Troubadours. A bit worse for wear, Glen Caraway, Louis Andre, and Bob Miller’s blues song “Papa’s Gone” is played hotter and more uptempo than the previous side, with a great bounce, and is one of my favorites. Originally a blues song performed by the likes of Rosa Henderson, this number seems to have been something of a standard in Texas jazz in those days, as it was recorded by at least four Texas-based bands in the 1920s and 1930s: first by Jimmy Joy’s St. Anthony Hotel Orchestra as “Mama Will Be Gone” in 1924, then by Eddie and Sugar Lou’s Hotel Tyler Orchestra as “Sweet Papa Will Be Gone” in 1929, then this one in ’30, and finally (or not?) by the Nite Owls in 1937. 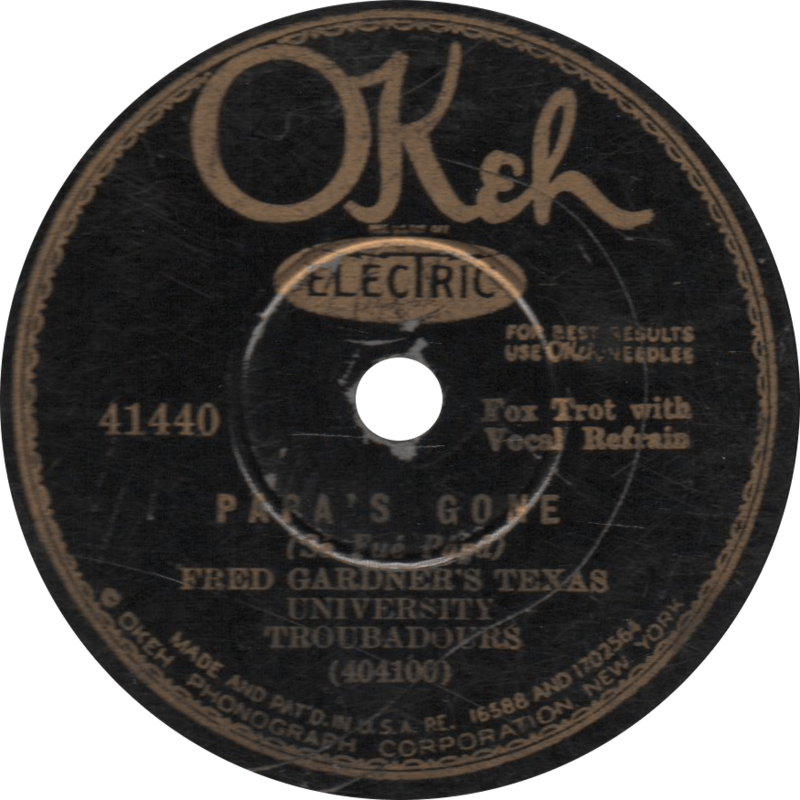 Papa’s Gone, recorded June 9, 1930 by Fred Gardner’s Texas University Troubadours. This entry was posted in Records and tagged 1930, 1930s, Bill Lewis, Blues, Bob Miller, Chester Seekatz, Field Recording, Fred Gardner, Jay "Bird" Thomas, Jazz, John Gardner, Lee Howell, Okeh, San Antonio, Steve Gardner, Territory Band, Texas, Tom Howell, Tommy Howell, W.C. Handy by R. Connor Montgomery. Bookmark the permalink.